Intravenous sedation, also known as monitored anesthesia care (MAC) or "twilight sleep," is a type of anesthesia that relaxes a patient through an intravenous (IV) placed in a vein. Depending on the surgical procedure, the amount of anesthesia used may range from a minimal amount, just enough to make a patient drowsy, to an amount so deep that the patient may not remember the procedure. 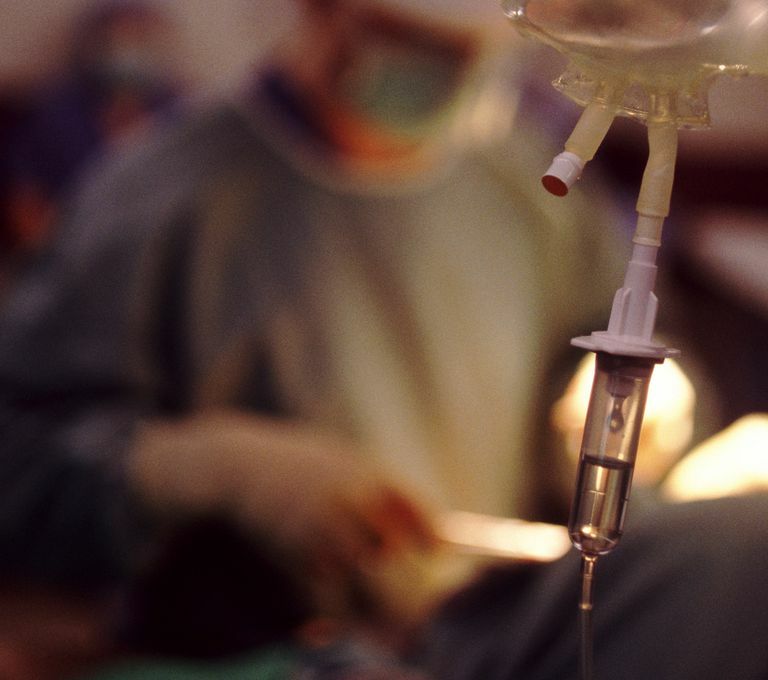 Deeper anesthesia is often used for minimally invasive procedures such as colonoscopy. IV sedation may be combined with regional or local anesthesia. Local anesthesia is an injection of medication that numbs a small area. This is usually used to remove a skin mole or skin cancer or to take a biopsy. Regional anesthesia is used to numb a larger section of the body, usually below the waist. The anesthesia may be administered through an injection or a catheter. Patients will be awake but unable to feel the area that has been numbed. This is usually used during childbirth and for surgery of the abdomen, leg, or arm. Monitored anesthesia, or IV sedation, is administered through a vein. Patients may be able to talk, depending on the level of anesthesia used, or instead be in a deep sleep. Patients are able to breathe on their own so that intubation (placing a tube into the windpipe) is not needed. IV sedation is used for a colonoscopy, some plastic surgery procedures, and is increasingly used for some procedures previously done with a general anesthetic, such a hernia repairs. General anesthesia is administered either through a mask on the face or intravenous until the patient loses consciousness. Breathing is controlled with an endotracheal tube that has been inserted into the windpipe. General anesthesia is used for patients having major surgery, such as knee or hip replacement or open heart surgery. Intravenous sedation is safe and effective for those patients needing minor surgery or a procedure that diagnoses a medical condition (a biopsy). Because the patient is able to breathe on their own with IV sedation, both the surgeon and the anesthesiologist become aware of the patient’s discomfort before the patient does and can respond with an increase in the local anesthetic or level of sedation. Heavy sedation has the ability to suppress the respiratory drive and requires careful monitoring of both respiration and oxygen saturation levels. If sedation is too deep, endotracheal intubation may become necessary. Prior to undergoing a procedure with intravenous sedation, you should advise your doctor about allergies or medical conditions you may have. You should also inform the doctor about any medications you are taking and any prior surgeries, including the type of anesthesia, you have had. You will be advised of the need to arrange for a responsible adult to drive you to and from the facility for the procedure. It's important to stop smoking before surgery to reduce the risk of slow healing after the procedure. Following your surgery, you will be given a list of instructions to follow as well as symptoms which should alert you to call your doctor. Most often you will feel groggy after your procedure and may have a slight headache and nausea. During the recovery process, your nurse will monitor your vital signs, including blood pressure, pulse, and oxygen levels. You will usually be observed for one to two hours after the procedure before you will be able to return home with your driver. It's often recommended that you have someone stay with you (and is a good idea) for the first 24 hours after your surgery. Intravenous sedation (IV sedation) or monitored anesthesia care (MAC) offers a safe alternative to general anesthesia for minor surgical procedures. It can provide sedation ranging from slight (mildly sleepy) to deep (deep sleeping.) Certainly, all forms of anesthesia have risks , and it's important to talk to your surgeon and anesthesiologist about any medical conditions which you may have, as well as care for yourself after the procedure and follow the instructions you receive. If you smoke, quit. Quitting smoking is probably the number one thing anyone who smokes can do both to increase the safety of anesthesia and the healing from any surgical procedure. Sohn, Hve-min, and J. Rvu. Monitored Anesthesia Care in and Outside the Operating Room. Korean Journal of Anesthesiology. 2016. 69(4):319-326. How Are Flaps Used in Reconstructive Plastic Surgery?